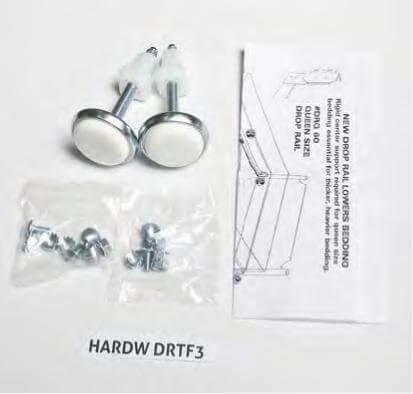 Why would I need a DRTF-3 Hook In Steel Bed Frame Full? 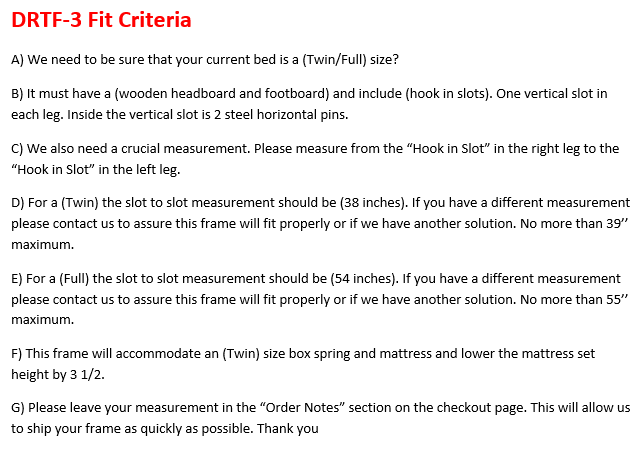 You wish to lower the height of your double or twin size mattress set. If you have a wood headboard and footboard with slots and hook in connections. 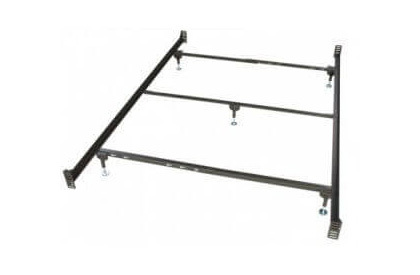 Need a heavier duty frame rail system that can support the weight of an adult. 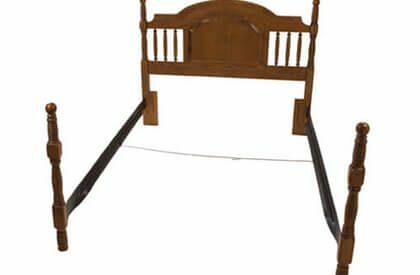 The side rails of your wood bed are missing or the wood side rails are broken or cracked. Whether your new DRTF-3 rails are for you, your spare bedroom, or your child’s room you can always count on the name Glideaway, when it comes to frame rails. 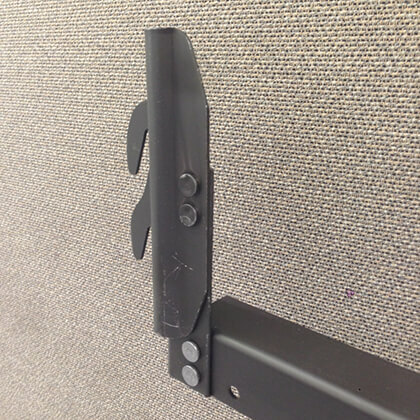 This Patented slat-less design hooks into nearly any Twin or Full size hook in head board and footboard design. 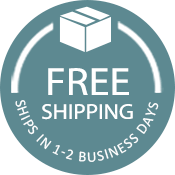 The side rails are made from 1 1/2 inch wide steel angle iron allowing for complete and total support of the mattress and foundation from one end to the other alleviating the need for wood slats. The special design allows for a nice snug fit on each end and includes a center support bar with feet at the frame’s center point for strength and to eliminate sides from spreading apart. Hook in rails are 77 inches in length. Once the side rails are installed the system provides an extra inch at each end of a 75 inch long full or twin size mattress. This is the perfect distance: Still easy to make and pillows won’t slide between the mattress and headboard. Dont need a bed that is 3 1/2 inches lower? No problem, check out the 1 CS Twin – Full Bed frame. 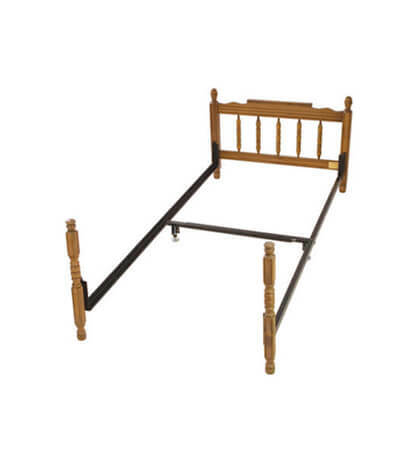 Ordered these for an antique headboard/footboard, and they are great! Sturdily made, they also lower today’s extra thick mattress to the height of yesteryear. So glad this product exists! I was searching for bed frames that could be adjusted to fit a full size mattress and just happened across this frame during my online search. Because I live in the area and didn’t want to wait for shipping I went to the showroom to purchase the frame. The frame was exactly as described, very study and easy to assemble…and fit PERFECTLY!!! Besides being completely satisfied with the product, the experience I had at the showroom was wonderful. I didn’t know these kind of businesses still existed! The customer service, both when I called on the phone and when I went into the store, was beyond compare. Not only did they go out of their way to explain how to install the rails, (even opened the box so they could visually explain how to install and then taped the box all back up!) they even explained how to adjust the center support rail should I run into a problem with the width of some of the older head and footboards. Lastly, the salesman said I was welcome to call if I had any questions and if for some reason it didn’t work to let them know. I will be sure to tell everyone I know not only is the frame top of the line in quality, going to STLbeds is a first class experience never to be forgotten!!! Checked around and STL has the best price, Customer service was excellent with our order. The only problems I had was one of the holes for the center support mount had to be drilled to allow the bolt to go through and If I may suggest adding some dense foam material to each end of the shipping box because the carrier roughed mine up and bent the ends and I had to straighten them before I could insert them into the head board and foot board. Otherwise a great product and it was exactly what we wanted! We have a Babi Italia Mayfair Crib that converts to a Full size bed. The crib is no longer produced and we have been searching for over a year to try to locate the conversion kit from Babi Italia to no success. We ordered the Full size, claw 3″ drop frame from STL Beds. The company called to confirm prior to shipping that the dimensions the frame required were correct and the template they have on their website for the claws fit. After checking, we confirmed and the frame arrived within the time we were told. One of the claws was slightly bent upon arrival, however, I was able to bend the metal back enough to have it not matter. The frame fit into the Crib slots, required a little hammering to ensure it was snug, but once it was in place, the frame worked amazingly. We also had a low profile box spring that we used and everything fits great! My wife and I are extremely happy with the way the frame turned out and highly recommend this frame to anyone who owns the Babi Italia Mayfair crib and are looking to convert it to the full size bed.